Saturday shenanigans with Maggie… It’s not what you think. I continued in the iron infested site and as I was digging a target I looked up and saw Maggie. She is a young, energetic, playful girl. She quickly grabbed my attention and a little piece of my heart. She is the residents 12 week old pure blooded German Shepherd. The resident was concerned that she was bugging me but to be honest I kind of enjoyed having a hunting companion. One of the guys I hunt with recently added a lab to his family and takes her hunting with him. This got me to wondering, Should I get my middle boy the dog he has wanted for a long time? He has wanted a German Shepherd for the last couple years. Hummmm I will run this by Queen Ukena. And in case you are wondering Maggie wouldn’t set still for a photo. I will keep trying. Anyways, I detected for about two hours and nearing the end of my hunt I dug my second keeper of the day. I was expecting another silver dime because the VDI numbers were the same as on the 59 Roosevelt. I was pleasantly surprised to see an old copper. I cleaned it up just enough to see what it was and this is what I saw. Needless to say after my last post this one got cleaned with water only. After the hunt was over our foreign exchange student and I got busy hanging the outside Christmas lights. We finished up just in time for dinner and the darkness to be illuminated. I was on my way to do an errand and saw a young fella (8-10 years old) metal detecting a front yard in Rose Hill. I quickly stopped and introduced myself. Come to find out he lives in NE Kansas and got his machine for a birthday present. It’s a small world as his mom knows some of the Queen’s family in the NE part of the state. Watch out Holton hunters you have some competition. I hope he enjoys the hobby as much as I do. All in all I think this was close to a perfect weekend day..
Friday morning I met up with another area hunter and we went to Silver City. We decided to hunt a new to us part of Silver City. It was kind of slow but I did manage to find $1.05 in change. I had a 64 nickel, 67 dime, and a 59 penny. I know the silver is there, I just didn’t get the coil over it. We decided to hit some empty lots that were previously a salvage yard… That speaks for itself. Later in the afternoon I went scouting and got permission to hunt an 1870’s homestead. The landowner has a couple other sites as well! The hunt wasn’t too spectacular but I did find some interesting relics. The buckle says Pat. MARCH 7. 1871. 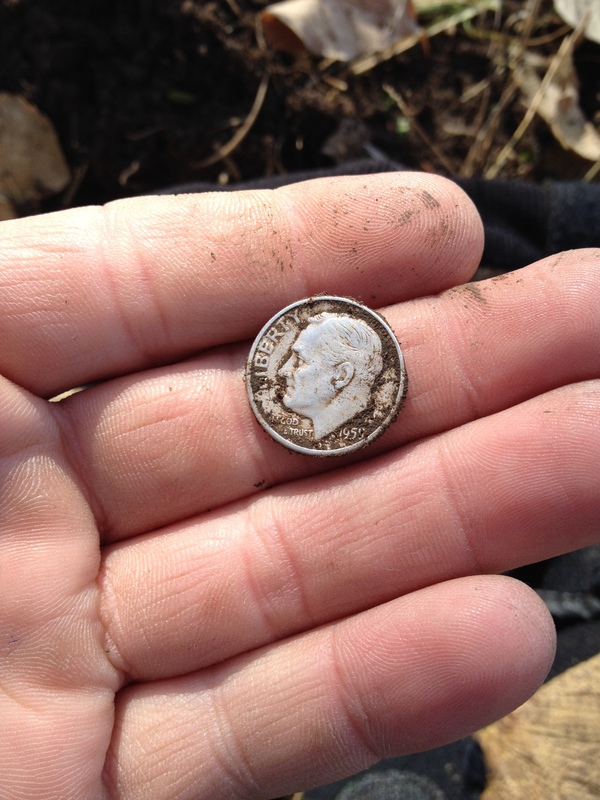 I plan on hitting this site again and hopefully some old silver shows itself. Happy Hunting and thanks for looking. Lesson learned the hard way..
Well today was my first trip to the ghost town school house. I met up with Miner and another local hunter just a little before noon. It was a sunny 35 degrees with a stiff Kansas wind. We got to swinging and we quickly came up with our hypothesis on where the school was. It was a slow hunt but eventually Miner came up with a 1900 indian head. This gave us hope that goodies were around. We dug many square nails, pieces of flat iron, and other less than desirable targets. I finally got a trashy signal that sounded just good enough to dig. I found an indian head that we thought was a fattie due to it seeing quite robust. I was pretty excited about possibly having an indian from between 1859 and 1864. Once I got home I started washing it off and could tell it was in good shape I could see that the head dress had the full Liberty and it was an 1899. Not as old as I had hoped but still a beautiful coin. Now the boys and I went out to church, dinner, and Cabelas. On the way home I got to wondering how I could get the coins original color back. I decided to try Brasso. The same Brasso that worked so well on my Nickels. THAT WAS NOT THE RIGHT THING TO DO. It quickly softened the copper and fine details were lost. I should have let it be green and beautiful. Lesson learned. I am excited to spend more time at the site because there was obviously a fair amount of activity there. I dug some relics as well. I will add a photo of them later today! Well today, I took the day off work because I had to take the youngest boy to his new “school” for some evaluations. 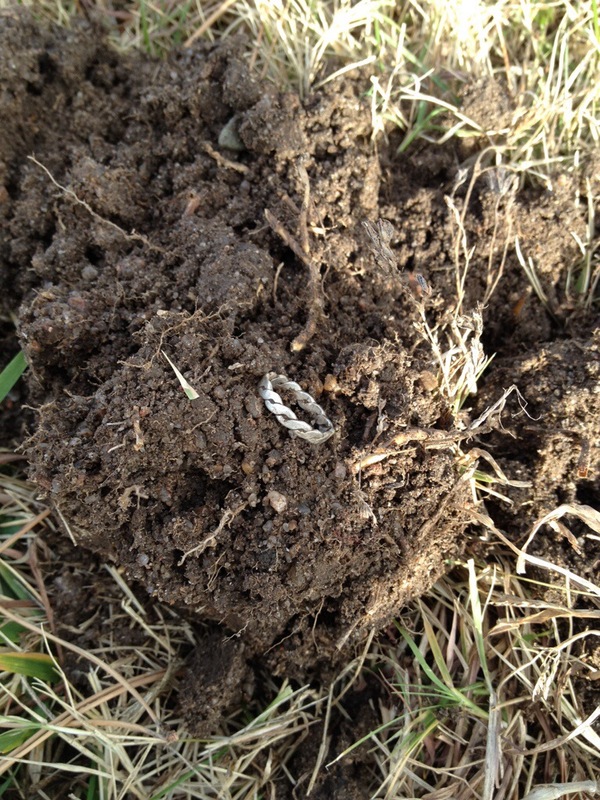 I had a little bit of time this morning before the day got busy so I went detecting. I ended up spending about an hour out in the 23 degree morning with a brisk wind. I visited a site that I have hunted before but didn’t have success the first go round. During the beginning of the hunt the finds were minimal. The site is tough because it is an old train depot and I believe they bulldozed it in place and left all the remnants there. 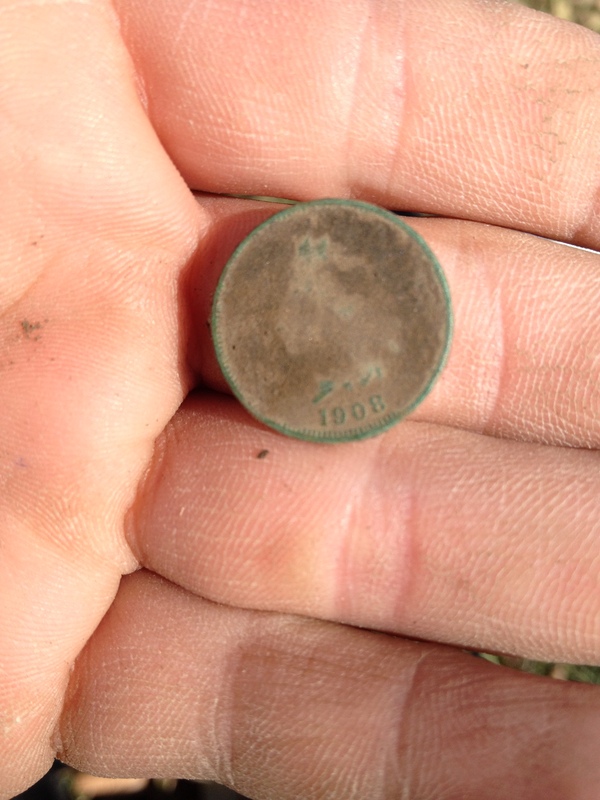 About 30 minutes in I got a pretty good zinc penny signal and dug the first interesting find of the day. 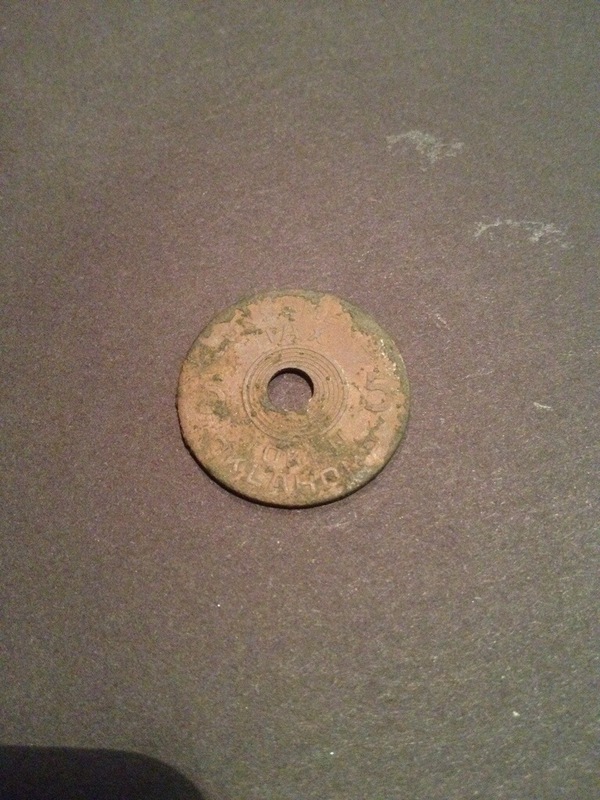 It was an Oklahoma sales tax token. 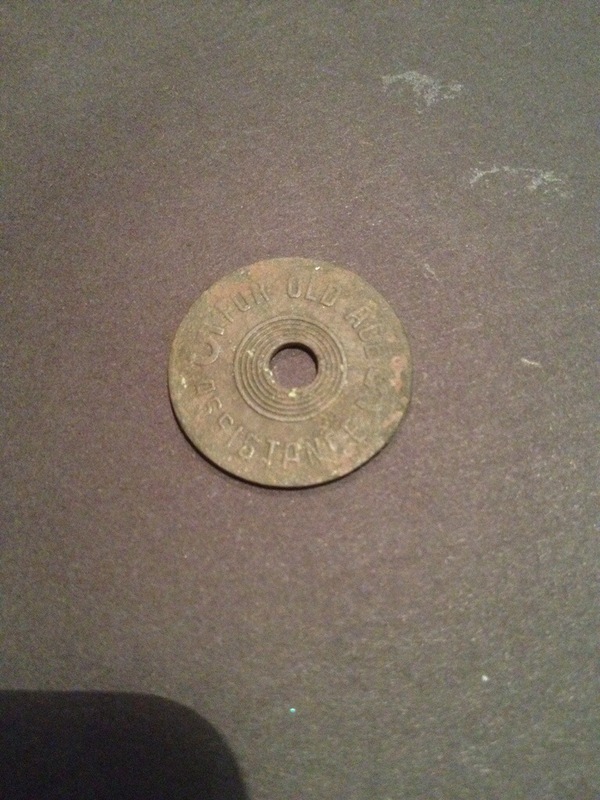 I have dug a couple of aluminum tax tokens from our neighbors to the south but this is the first zinc one. I’m thinking the difference is due to the value of the token. My previous tokens were 1 mil and this one is a 5 mil token. Tomorrow we will be detecting the ghost town school house.. I can’t wait! 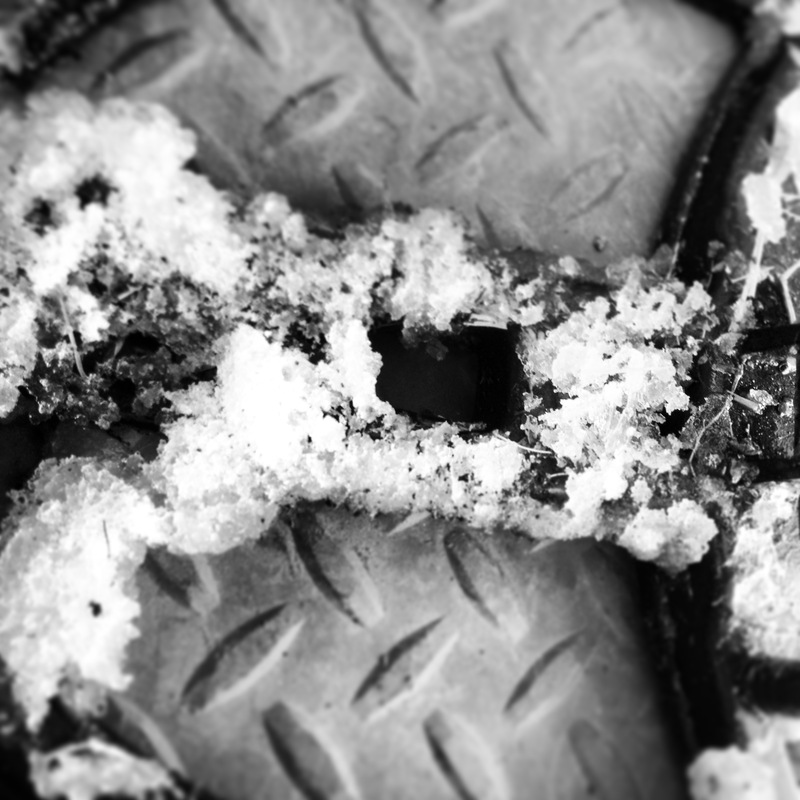 Cabin Fever… No but we should get creative! It’s that time of year when people start talking about the cold weather, holidays, and cabin fever. Not me my friends I am ready! This Saturday I am hunting one of the more promising sites of the year. I’m hoping that the tiny old school yard will produce some of my best keepers of the year. They are calling for temperatures in the teens and possibly freezing rain and snow on Friday. I have hunted in weather like this and as long as you go prepared it’s not bad. We have poured over the maps/aerials and we have a pretty good idea of where the school set but we should probably get creative and think about action around the school as well. What were peoples actions like around a school in the late 1800’s? I’ve heard they were used for religion, civic groups, and other activities.. We shall see! While on the topic of creativity. I listened to the American Digger Relic Roundup the other night that discussed the FMDAC summit conference. I personally think we (as a hobby) need to get creative. There is a whole digital world out there that is a great asset to people trying to get together. I know that certain groups have made steps in the right direction but let’s get creative on how to reign people in our hobby in. If you get all the manufacturers of detectors, accessories, and clubs on board it could be a pretty big force. I have to think the efforts of that one group would be very strong. I have recently heard from many folks that our club (The Wheat State Treasure Hunters) is opening doors never opened. I think that treasure hunters in general tend to enjoy solitude and alone time. I myself enjoy the alone time and solitude. However, I don’t think we should let that get in the way of promoting the hobby and protecting our rights. Everyone should speak up and get a friend to speak up as well. Anyways just a small rant about people deciding to hang in the shadows and not step out into the open..
Well today we didn’t have much on the agenda. 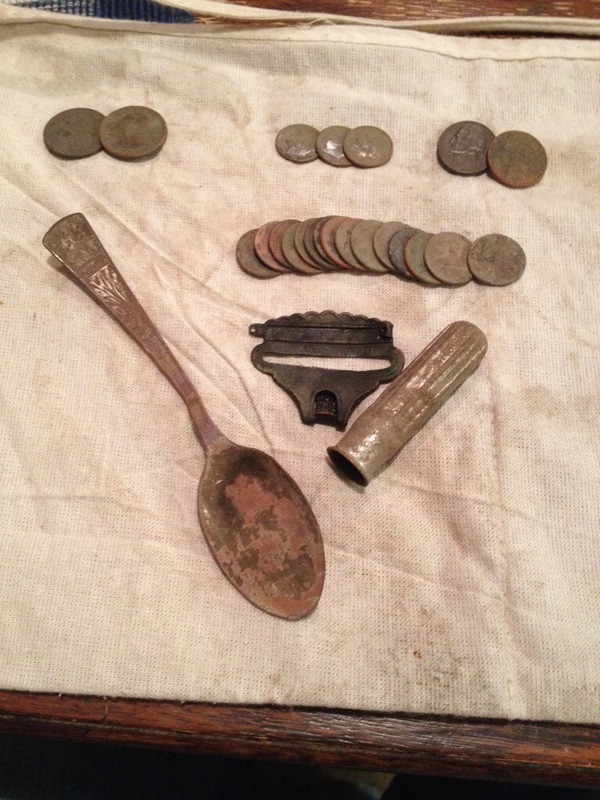 Last night I decided that I would start metal detecting at a local school. I sent an email out to the Wheat State Treasure Hunters inviting the group. We ended up having 4 people show up and hunt. A good time was had and we all agreed we should do it more often. 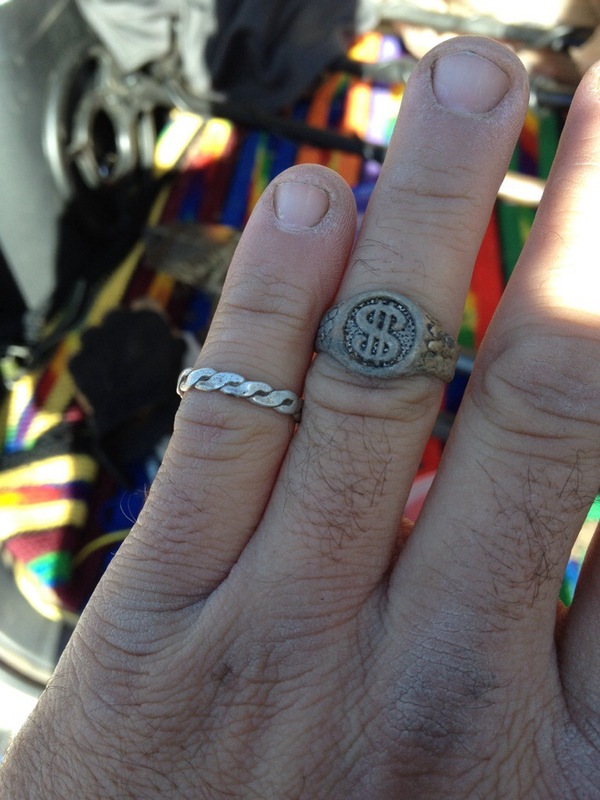 I personally found a little silver ring, bunch of clad, a bling ring, and two wheat pennies. Also found was a Showbiz pizza token and a Girl Scout pin. The whole time we were detecting my mind was looking forward to my afternoon hunt. Pulltab and I made plans to hunt a train depot in a ghost town that was built pre 1885 and stood until 1912. We were greeted by a half dozen horses that were very intrigued by us. We quickly learned that this would be a brutal hunt. It seems as though someone operated a junk yard in the property in between. We dug old car parts, building parts, and a few interesting relics. 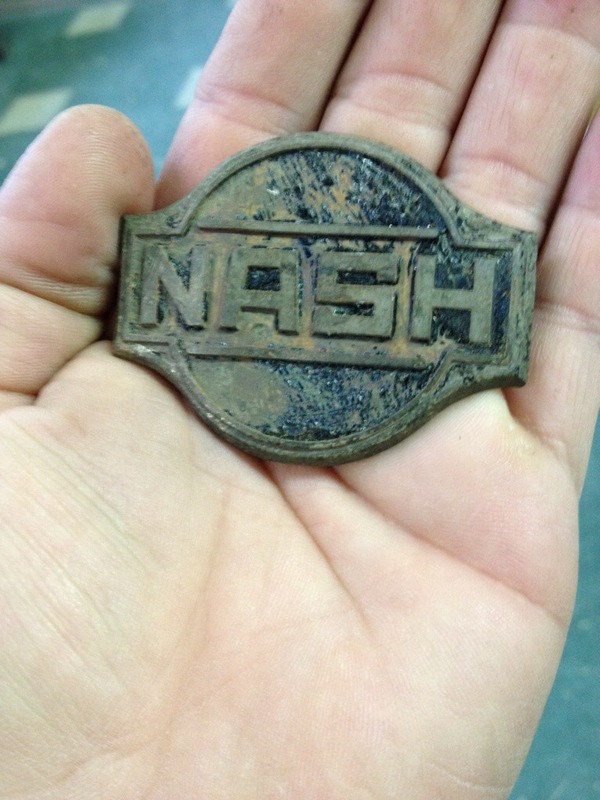 My coolest find was a Nash emblem. I had been trying to get permission where the school house was in this ghost town. As Pulltab and I were finishing up this hunt the gentleman that owns the school house property showed up. He granted us permission so we will be hunting it in a couple of weeks. I am hopeful that it will be more productive than the train depot! !